The Queen and prime minister are among guests at the Festival of Remembrance in London to commemorate those who gave their lives for their country. An audience of ex-servicemen and women will enjoy performances by artists including Jamie Cullum and Hayley Westenra in the Royal Albert Hall. Other royals present include Princes Philip and Andrew, the Earl and Countess of Wessex and Princess Royal. The Royal British Legion's festival is held on the eve of Remembrance Sunday. Greeted on arrival by trustees of the Royal British Legion, Gordon Brown told president Lt Gen Sir John Kiszely: "Thank you for everything you do, we much appreciate everything you do." Mr Brown was accompanied by his wife Sarah. During the ceremony, scarlet poppy petals are to fall from the great dome to represent all those who have died in combat. Ms Westenra will sing We'll Meet Again in honour of the original armed forces sweetheart, Dame Vera Lynn. Also performing are the Fron Male Voice choir from Froncysyllte in the Welsh Vale of Llangollen. A tribute to D-Day veterans in the 65th anniversary year of the landings is also planned. 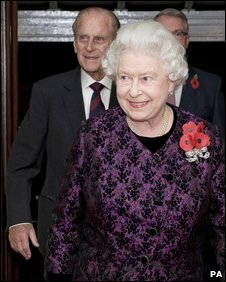 Also attending are war widows wearing the Elizabeth Cross, the new award given to families of those killed while on active service. The citation is being read by Kate Nesbitt, the first woman in the Royal Navy to be awarded the Military Cross.